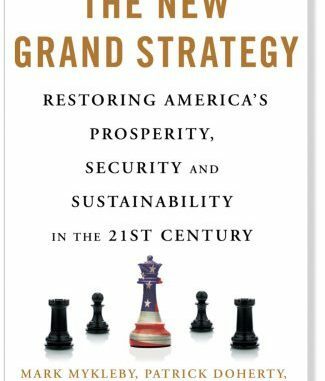 Lawrence Wilkerson recommended that I read The New Grand Strategy: Restoring America’s Prosperity, Security and Sustainability in the 21st Century by Mark Mykleby, Patrick Doherty, and Joel Makower. The authors direct and teach at the Strategic Innovation Lab at the management school of Case Western Reserve University, where Wilkerson serves as a senior advisor. The back story of this effort to develop a grand strategy for America came from the military. Required to develop a military strategy for America, Admiral Mike Mullen as Chairman of the Joint Chiefs of Staff ran into an important challenge in the Bush II administration. America had no strategy and its default strategies were not aligned with the emerging 21st-century world. Mullen stepped in to fill the vacuum. Mykleby was part of that first Mullen initiative. Then Mullen and Mykleby teamed up for a new effort with Doherty when they left the military. They then met up with Makower, an expert in sustainable business and clean technology. The three authors — Mykelby, Doherty, and Makower — cover many important areas of opportunity, including new fabrication technologies, transferring from our dependency on fossil fuels, rebuilding our infrastructure, regenerative agriculture and re-engineering our homes and communities for a healthier lifestyle. The quality of their ideas show that they have studied for quite some time and have networked across many sectors. They have depth, and they produce good research, stories, and ideas. The book is well written, easy to read. One of their later chapters, “Not Waiting for Washington” is worth emphasizing. If you are a municipal official or the head of a private company, get this book, see what ideas are good for you, and get going. Our environment needs everyone to take action wherever we can. Action happens best on a decentralized basis — at personal, intimate, and local levels. The authors offer us a rich, well-written menu of good opportunities. One question facing the developer of any strategy for America is whether to address the depth of the corruption and the inexplicable weirdness of inhuman and lawless developments around us. Forces are at work driving for centralized control — they could not care less if America is successful. In the face of such forces, some believe it is better to focus on getting something positive done directly rather than addressing issues that could give offense politically. Their reluctance is the approach of people committed to working within the establishment, such as the three authors of The New Grand Strategy. My favorite book on solutions is Robert Axerod’s The Evolution of Cooperation. Axelrod underscores the power of transparency. Material omission of risk issues destroys the economics of many good strategies. This is why I left the establishment. We need media to ask the unanswered questions and to address what is really happening – including the risk issues that Mykleby, Doherty and Makower dare not mention. Solari Report subscribers are managing these risks every day — with real implications to their assets, health and loved ones. My opportunity is to help them now. With sufficient transparency, academics and other members of the establishment could extend their strategy to a model financed broadly with real equity. Equity investment that produces real risk-managed return is the wealth building alternative to centralized corruption that entrains and harvests productive citizens, grows government debt to fund monopolies and requires political correctness for protection. In the meantime, both approaches — working inside the establishment where alignment is possible, bringing transparency from outside the establishment where alignment is not yet possible — move us in a positive direction. If you are interested in how to “make America great again,” this book is recommended.